Asia Pacific Printed Cartons Market « Global Market Insights, Inc.
Amcor’s yesteryear acquisition of Alusa to expand its business profile in South America is an apt instance depicting consolidation of printed cartons market which is indeed claimed as an integral vertical of flexible packaging business sphere. Reportedly, Amcor’s acquisition of South America based flexible packaging corporation, Alusa, for USD 435 million in June 2016, provided a substantial boost to the former not only in terms of regional expansion but also in the enhancement of its product and customer base. With this transaction, Amcor has successfully catered an expanded customer base in South America market, spanning across Chile, Columbia, Argentina, and Peru, along with its existing leadership in North America and Asia Pacific. The deal, as claimed by the company, has left unmatched impact on Amcor’s profitability portfolio in the Flexible packaging industry, in extension strengthening its position in the printed cartons market. Some of the renowned contenders in printed cartons market include Lithoflex Inc., Tetra Pak International S.A WestRock Company, and Winston Packaging. Speaking of the geographical aspects, North America is touted to be one of the major growth avenues in the global printed cartons market, augmented by the thriving demand from electronics and hardware sector. 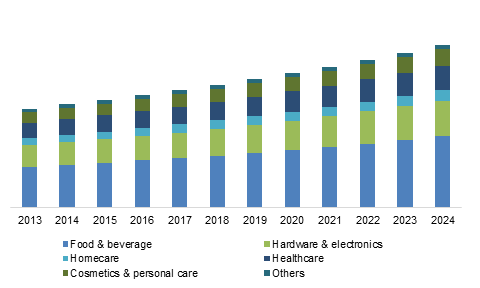 Substantial investment in research activities which has led to immense advancements in electronic devices is presumed to be the prime factor driving the regional industry outlook. Statistics further validates the fact- North America printed cartons market has marked a valuation of USD 30 billion in the year 2016. Fierce competitive mindset among the leading giants to standout from their existing contemporaries has ultimately resulted in an increased adoption of innovative packaging solutions, making a significant contribution toward the overall industry share. Recently, AMBER university researchers have launched a 2D nanomaterials based printed transistor model, which is claimed to be a breakthrough for potential applications such as food packaging. Endorsed with unique electronic properties, this two-dimensional nanomaterial, is reported to be incorporated with a digital countdown that would warn the consumers with regards to food spoiling. The incessant efforts undertaken by the giants partaking in the printed cartons market with regards to path breaking innovations in food packaging solutions has undoubtedly enhanced the profitability quotient of this industry. In fact, estimates claim, printed cartons industry share from food and beverage applications is expected to witness a y-o-y growth of 5.5% over 2017-2024. Acquiring an appreciable revenue of USD 40 billion in 2016, APAC turned out to be another profitable belt for printed cartons market investors. Increasing demand for expedient packaging solutions in terms of cost, transport, storage, as well as customer viewpoint has provided a significant impetus to the regional market. In addition to this, the demographic chart of 2016 depicts that APAC belt is home for nearly 60% of the world population – a factor that has stimulated a range of socio economic aspects propelling several end-use sectors such as electronics, healthcare, and food & beverage, in turn proliferating printed cartons market size. As per estimates, APAC printed cartons industry share is slated to experience a y-o-y growth of 6% over 2017-2024. Despite the threat to the market growth by the cost issue associated with digital printing techniques, printed cartons industry is set to attain remarkable gains in the forecast spell, subject to its wide array of applications in domains including electronics& hardware, food & beverage, cosmetics, healthcare, and residential. A recent report put forth by Global Market Insights Inc., forecasts printed cartons industry to exceed a valuation of USD 188 billion by 2024, with an estimated CAGR of 5.3% over 2017-2024. This entry was posted in Polymers and Advanced Materials and tagged Asia Pacific Printed Cartons Market, Europe Printed Cartons Market, North America Printed Cartons Market, Printed Cartons Market, Printed Cartons Market Analysis, Printed Cartons Market Forecast, Printed Cartons Market Growth, Printed Cartons Market Outlook, Printed Cartons Market PDF, Printed Cartons Market Report, Printed Cartons Market Share, Printed Cartons Market Size, Printed Cartons Market Update.